Aslan's Daughter. The Lion, The Witch and The Wardrobe. Aslan had a daughter, who he sent to the same world as the Pevensie's were originally from. His daughter was sent to live with Professor Kirke, and he adopted her as his own child. When the Pevensie's come Grace is more than happy. He Shouldn't Be Saying Anything! They Don't Even Know The Prophecy! What Have You Done? Lucy! Grace! Why Can't You Do As Your Told? I Will Not Let Them Take Narnia Form Me. Ana is a human hiding in Narnia. She has a secret that most of the Narnians don't know about. Revealing it would mean she wouldn't have to spend her whole life in hiding, yet she does. Why? Will she be forced to reveal it to the Pevensies to save their lives or can she still hide it after all these years? 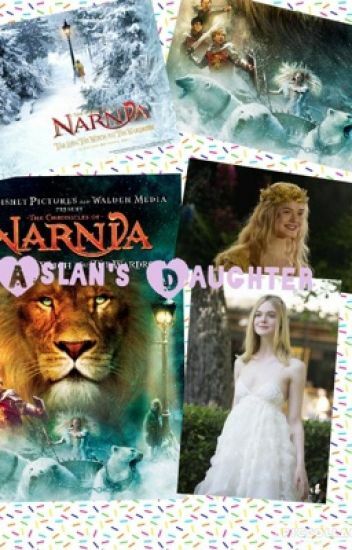 Rose is a lioness living in Narnia with her father Aslan. When she was twelve ,the white witch attacked,sending his only child to live in the human world ,Aslan knows that the two daughters of eve and sons of Adam will cross paths with his daughter . "Who's here?" I ask him. Aslan didn't answer me, he just roared. Then it got to me, the Pevensies have come back. "Just because I'm an ice princess, it doesn't mean I don't have a warm heart." - Silveena, the ice princess, is known to be the white witch's daughter. Silveena has never wanted to follow her mother's footsteps, she'd thought that what she's doing is cruel and unnecessary. But once two sons of Adam and two daughters of Eve enter Narnia, would she either stick with her cruel mother, or find love with a human? Peter Pevenise love story she is the daughter of Aslan. She is adopted by the Proffesor what will happen when she goes back to Narnia. Amber Scrubb is the older sister of Eustace. Unlike her brother she is kind caring and loving but most of all she believes in Narnia. Amber wants nothing more than to get there. On her way to school will she and her cousins find their way to Narnia? (The Sequel to "The Quest for Narnia: The Hidden Queen") Madi has left her home with the professor, and her heart break. She was over the fact that Peter had broken up with her, after everything they had been through. When she becomes reunited with them at a subway station in England, what will happen when they're magically transported to Narnia? It is likely that you have heard the stories of a wonderful land in another world, a land called Narnia. And if you have, you have probably also heard of the four Pevensies, who discovered the land of Narnia by stumbling through a wardrobe. You would have read of the wonderful adventures they had in there, and how they became great kings and queens of Narnia, legendary rulers of their own country. But you have not heard of me, and my part in those same adventures. For my name is Rose, and I was merely a young girl lost in the turmoil of the second World War. But I also found that country, and through my actions, I affected the entire course of Narnian history. My story is one of love and beauty, of evil and the poison of hate, of adventures and journeys into the unkown, of the love of two rulers, of great battles and golden eras of peace. My story is one of unrequited love and frustration, of friendship and great sacrifice, and of many choices one is forced to make throughout life, whether they choose right or wrong. Rachel Pevensie is Peter's twin and while Peter is the fatherly figure Rachel is the motherly figure to her siblings. Join Rachel on her adventure to Narnia. Everyone knows the White Witch,  but not everyone knows that she has a sister. She's the polar opposite of jadis. She prefers the heat and all different types of warm things. And most of all she's not evil. This is her story on how she met the kings and queens of Narnia and helped them take down her sister. A/N-  Okay so this wont be all lovey dovey, because they're 13 and because Edmund is away from his family for basically half the movie.